Audiovisual is essential to communication throughout healthcare systems. 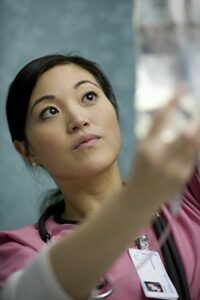 Video conferencing, paging systems, digital signage and support have become an integral piece of medical organizations. Working with some of the largest healthcare providers in Idaho has given us a clear understanding of the AV capabilities required in medical environments. This experience has helped us identify common areas of failure for AV in healthcare, allowing us to provide better solutions. Unified Communication, when video conferencing works together with elements like screen sharing and interactive displays, brings together each component of healthcare conferencing into a single platform. 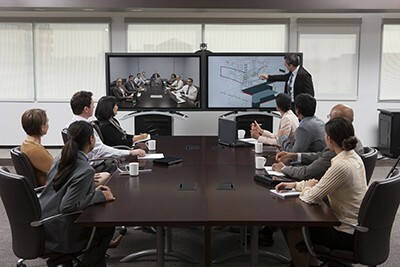 Audio Visual systems combine video, audio, screen sharing and file sharing to work simultaneously during meetings. Our unified communication systems are custom designed, programmed and integrated to fit the needs of the spaces they are in. These systems can include multiple displays, interactive whiteboards, video conferencing, screen sharing, file sharing and more. Effective design and integration increase efficiency in critical meetings. Healthcare security requirements are unique and finding a secure video conferencing solution is critical. Our suppliers offer encrypted video collaboration which supports security compliance. Neurilink works with manufacturers committed to providing healthcare customers with solutions that align with today’s security requirements. Polycom and other vendors provide a set of features which can address risks to healthcare systems. These suppliers utilize firewalls, encryption and integrity (authentication) to facilitate secure communication. Digital signage is making its way into healthcare systems to increase patient engagement, learning, and ease of navigation around the hospital. Digital signage can be used in waiting rooms or exam rooms to educate patients and help them in an emergency by instantaneously sending alerts throughout the system. Digital wayfinding assists patients in finding the right office and getting to their appointment on time. It’s also flexible and can be revised to address expansion, special events, and more. Network security is critical in healthcare systems, so finding the right AV support can be difficult. Since remote monitoring through networks isn’t always an option, we offer unique support solutions for our customers. Our on-site support is a preferred solution for healthcare organizations. 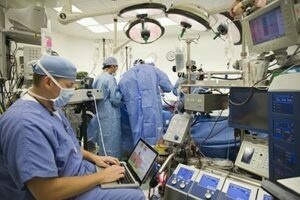 Reliable AV systems are critical in the healthcare environment where faulty platforms can affect business costs by wasting physician and leadership’s time. We offer on-site staffing for organizations where AV up-time is critical. This solution is our highest level of service available, with real-time troubleshooting and fixing of AV issues.